Whilst the world's attention is firmly fixed on the 2012 Olympic Games in London, I thought this would be an excellent time to look back at the postage stamps issued to commemorate the last time the Olympics were staged in London - The Games of the XIV Olympiad. Issued on 29 July 1948 to coincide with the opening ceremony that day, these games were significantly the first Summer Olympics since the 1936 Games in Berlin – the advent of World War II had seen a twelve year interruption, and the London Games therefore took place in a time of post-war austerity. This was the second occasion that London had hosted the Olympic Games, the first being back in 1908. 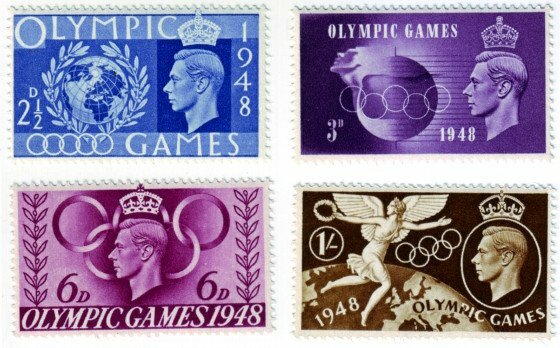 The stamps issued in 1948 were stunning in their simplicity, incorporating King George VI and the Olympic rings, and were designed by artists in a variety of fields. 1 shilling (brown) – Winged Victory was designed by French book illustrator Edmund Dulac, who would later be one of the designers of the Wilding series stamps, the first definitive stamps of the reign of Queen Elizabeth II.